I giggled throughout this book. Her chapter titles are even amusing. There is Failing At Everything in the Greatest City on Earth and Roasts Are Terrible, plus many more. 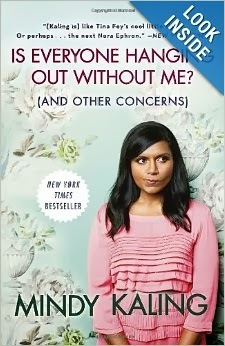 And yes, she even has a chapter about The Office, which I loved. There was even a picture of John Krasinski which I quite enjoyed. This would make a fantastic Christmas gift. I would so give this book to my family and friends. You can purchase Is Everyone Hanging Out Without Me? (And Other Concerns) here. Follow Mindy's hilarious tweets here. I can see you two hanging out. You're both hilarious and writers, apparently! I didn't know she had a book! I didn't know she had a book either - loved the Office. I never saw her new show, but remember her on the office. Sounds like a really great stocking stuffer.